LOVE FREE OR DIE is about a man whose two defining passions are in direct conflict: his love for God and for his partner Mark. 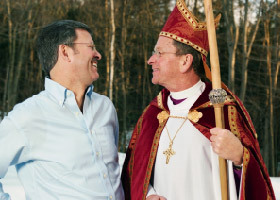 Gene Robinson is the first openly gay person to become a bishop in the historic traditions of Christendom. 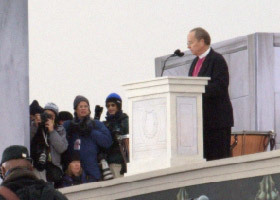 His consecration in 2003, to which he wore a bullet-proof vest, caused an international stir. The film follows Robinson from small-town churches in the New Hampshire North Country to Washington’s Lincoln Memorial to London’s Lambeth Palace, as he calls for all to stand for equality – inspiring bishops, priests and ordinary folk to come out from the shadows and change history. The film debuted on the national PBS series Independent Lens October 29, 2012 and will be rebroadcast nationally June 3, 2013 in celebration of Gay Pride Month (check local listings). Join the discussion via Twitter hashtag #lovefreeordie. Find a screening of LOVE FREE OR DIE coming up near you. Plus, bring the film to your community. Find all the images and info you need to talk about LOVE FREE OR DIE in the media or with your digital and print followers. Plus, see what others are saying. Sign up for updates about LOVE FREE OR DIE and the action campaign for marriage equality.